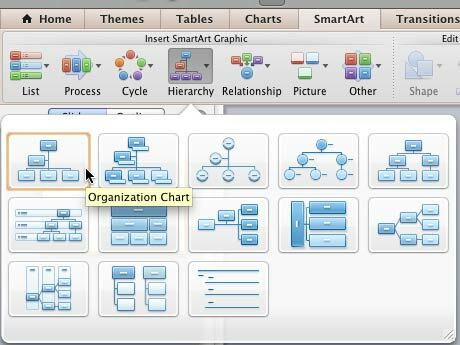 Excerpt/Capsule: Learn how to insert an organization chart in PowerPoint 2011 for Mac. Create a new presentation by launching PowerPoint, you will see the Presentation Gallery -- click Cancel in this gallery to open a blank presentation with a new slide. 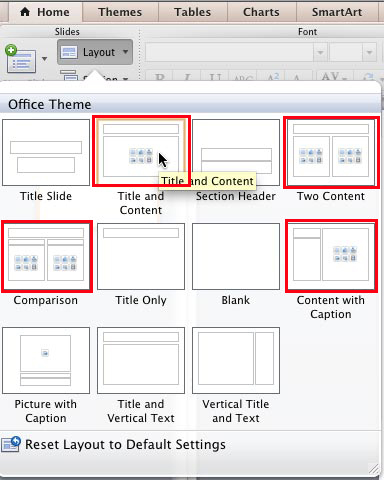 Or open an existing presentation in PowerPoint 2011. Next, you insert a new slide -- by default your new slide may use the Title and Content slide layout. However, if you created a new presentation altogether, it might contain a new slide with the default Title Slide layout which you need to change to any other layout that includes a content placeholder. A content placeholder, explained later in this tutorial is part of the layouts highlighted in red in Figure 1 (shown later in this tutorial). 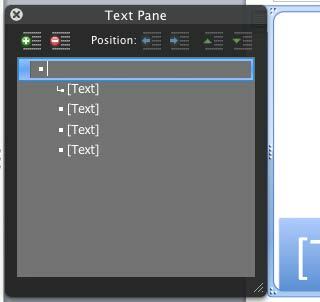 Click the Layout button in the Home tab of the Ribbon to bring up the Layout gallery as shown in Figure 1. Select any of the layouts that include a content placeholder (the small palette like collection of multicolored buttons visible on some of the slide layouts (see Figure 1 again). Note: A content placeholder allows you to add bulleted text or any of the six other content types, indicated by the 6 buttons you see highlighted in red in Figure 2. 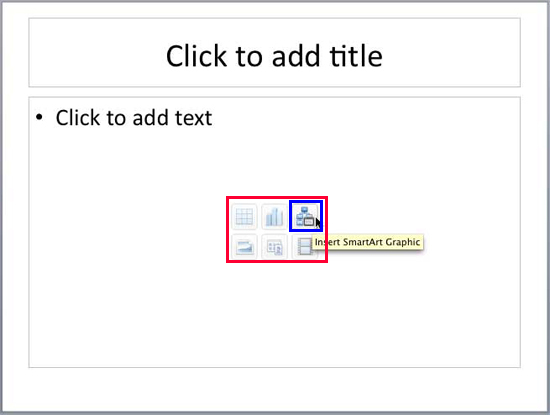 Now that your slide layout has a content placeholder, click the Insert SmartArt Graphic button among the six buttons in the content placeholder that you can see highlighted in blue in Figure 2. Click the SmartArt tab of the Ribbon (highlighted in red in Figure 3). Any of the methods explained above will bring up the options within the SmartArt tab of the Ribbon - in this tab, locate the Insert SmartArt Graphic group which includes several buttons that represent various types of SmartArt graphics as you can see in Figure 4. Now, click the Hierarchy button (highlighted in red in Figure 4) to open the Hierarchy SmartArt drop-down gallery as shown in Figure 5. This gallery provides you with some Organization chart variants. 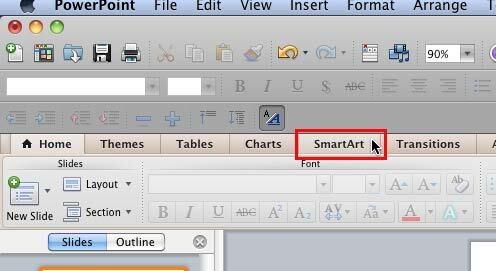 Hover the cursor over any of the previews and you will see a tool-tip displaying the name of that SmartArt type as you can see in Figure 5. Select any Organization chart of your choice and click on it. This will place the selected Organization Chart on your slide, as shown in Figure 6. 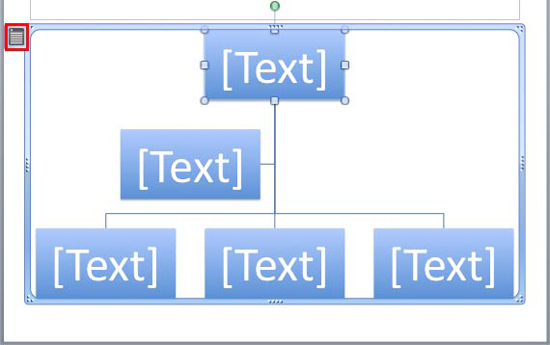 Once the Organization Chart is placed on the slide, click on the Text Pane icon (highlighted in red in Figure 6 above) to open the text pane (see Figure 7). Note: Want to add more shapes to your organization chart? A subsequent tutorial will provide you with more information.